The Internet has exploded today in protest of SOPA (Stop Online Piracy Act). Google is expected to run an anti-SOPA banner on their site. Wikipedia, meanwhile, is completely down. The only Wikipedia page you can actually read right now is about SOPA (but don't try clicking on any links, you'll be re-directed to the same "Wikipedia is closed for business" page). Meanwhile, all the big media outlets are focusing their attention on just how bad this SOPA bill is, including sites like Time Magazine, which is actually owned by Time Warner, a supporter of the bill! So what the hell is SOPA? Well, it's a bill that is intended to prevent internet piracy but will actually make it much easier for the big media companies to sue the pants off anyone they deem to be using pirated content. Here's a video run-down of what it means (or you can watch a much more simplistic – and funny – run-down at the Oatmeal). The app Boycott SOPA scans products and warns you if the manufacturer supports SOPA. 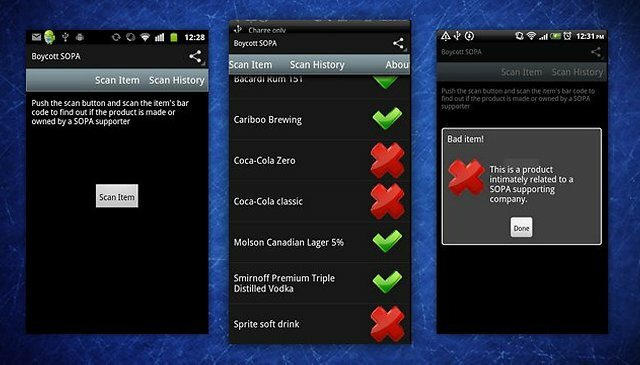 Using the barcode scanner function on your Android, "Boycott SOPA" scans and checks the products against a user-curated database of companies that currently support the Stop Online Piracy Act, thus letting you know "if buying that boy of tissues is going to ruin the Internet or not," as ReadWriteWeb says. So far, the app seems to be a great success and has racked up hundreds of five star reviews in the past 10 days. While you may think it's obvious which companies support the bill (Time Warner, Disney, BMI and other media companies), some are much less obvious. I was surprised to learn that cosmetic companies like Estee Lauder and L'Oreal support the misguided bill, as well as clothing companies like Lacoste, Timberland and Liz Claiborne. The list of supporters, in fact, is so long and bizarre that I can see this app being very helpful. As one review on Android Market reads, the app "puts the power in the consumers hands. No longer are the corporations going to have say over us; we can directly affect their incomes. This is massive."